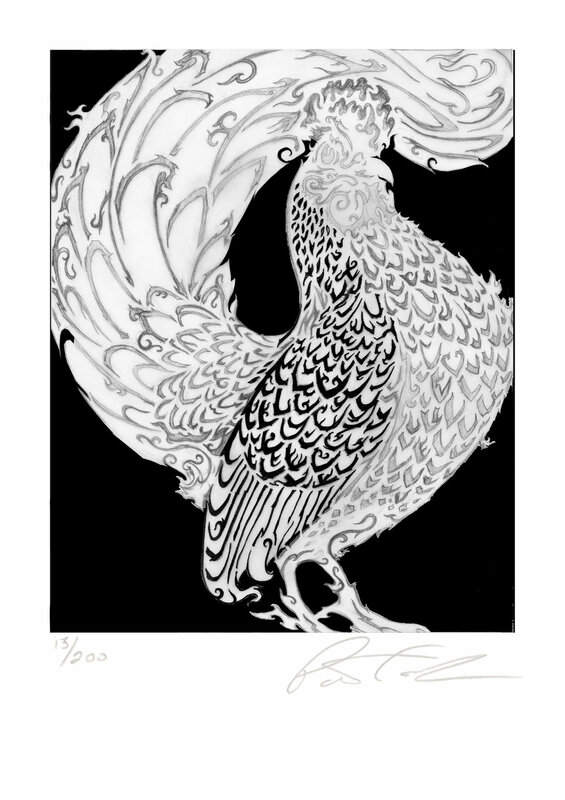 I would love to show the many, many different changes this Rooster went through on his arduous, slow journey from imagination to sketch to the final drawing you see above. Unfortunately, I can’t. These one-color/one-layer pieces I make (usually with the intention of turning them into LaserCuts later) evolve differently from my full-color work. The fact that I’m not paging through sheets and sheets of colored and textured papers chasing after inspiration is a major reason. But it runs deeper than that. The entire process is more… I want to say streamlined, but that sounds overly-positive and strategized. The truth is a little messier, a little more chaotic, and a lot more open to spur-of-the-moment luck. My usual process includes a lot of sketching. Tons of it. From very messy sketches where I’m the only one who can actually see any figures, all the way to full-blown shaded drawings. By the time I get to the LaserCut images, I’ve already finished the full-color Eto animal, sometimes months before (for comparison, see this Sonic Ram & this Laser Ram; or this Black Horse & White Horse). The color Eto pieces are a series. While sketching them, I always rock out some drawings I love, but that clash stylistically with the other pieces. Maybe the layout or crop is off. Maybe the stylization is different. Maybe they don’t lend themselves to colored layers. Maybe the concept is just not at one with the rest of the series. Whatever the reason, I’m drawn to revisit them. Some, like the Year of the Sheep and the (unfinished) Year of the Monkey begin as design concepts that I want to play with. 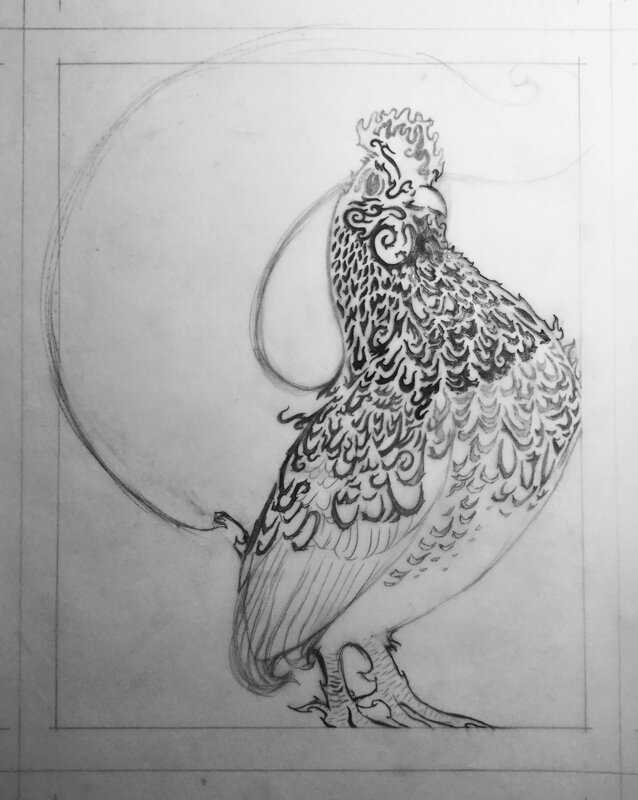 Others, like the Year of the Horse and this Rooster are more about letting my pencil do whatever it wants to do, and just going along with the flow. Which brings me back to the futility of showing how this piece evolved (for the most part). Basically, its just that I erased large chunks of this bird. Over and over again. Those (mostly poor) ideas and sketchings are lost forever to the ravages of the eraser. There is some evidence of these changes. The basic layout hasn’t changed, but this first incomplete drawing tells a story of very different feathering. If you look at the sketchbook page, you’ll see that I experimented with a few different patterns. Sometimes what works on a small scale doesn’t translate well in the final art. 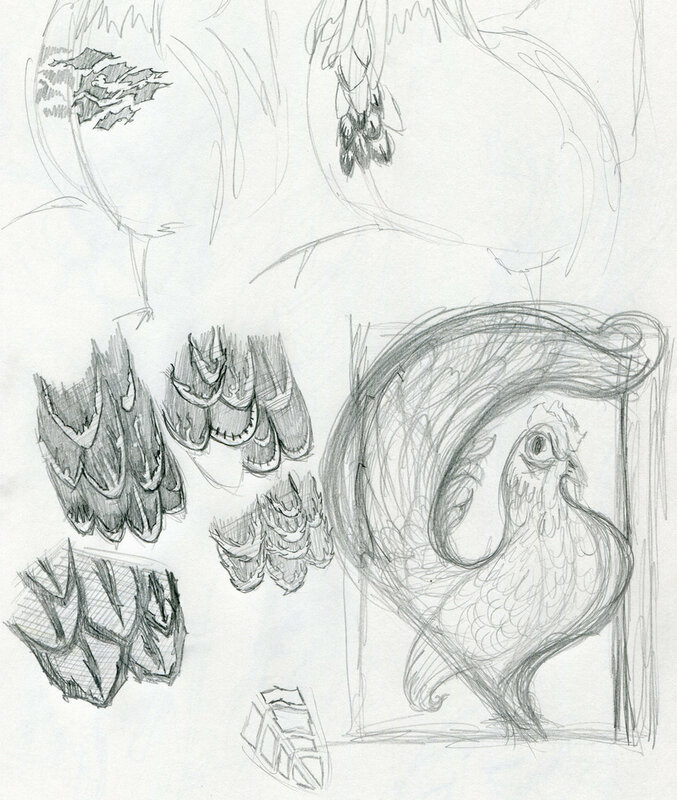 These feathers were an attempt at organic, abstract shapes. For me, they were too much of a departure from what excited me about the drawing in the first place… and maybe were more appropriate for a pigeon than a chicken. And then there was that pesky tail. That’s an example of being a little too much in love with an idea, and refusing to admit when it really isn’t working. After putting the piece aside for a while, it seems obvious.